Salmon fillets – like chops – are one of the things we turn to most often for an easy meal. Farmed organic fillets are reasonably inexpensive, healthy, and there’s never any waste. This recipe is also lovely made with gurnard. To make the lentils, heat the oil in a saucepan and gently cook the onion, celery and carrot until softening. Stir in the lentils, thyme and stock. Season with pepper. Bring to the boil, reduce to a simmer and cook for 15–20 minutes. Watch carefully; the lentils can collapse very quickly. Heat the butter and oil for the salmon in a large frying pan. Season the fish on both sides and cook over a medium heat, flesh down, for 1 ½-2 minutes, until golden. Turn and cook for 1 ½–2 minutes. Reduce the heat, cover and cook until done but still moist. When the lentils are cooked, add the lemon juice and a good slug of extra virgin olive oil and taste for seasoning. 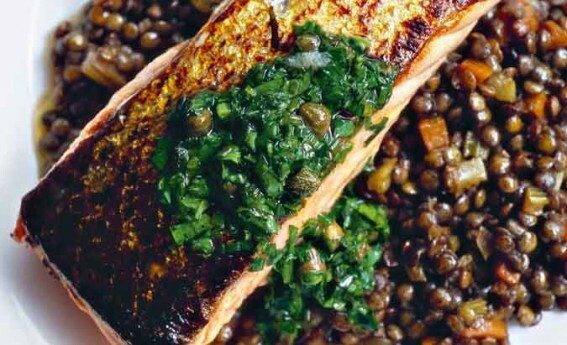 Put some lentils on each plate and top with salmon and a good spoonful of relish. Crispy-skinned salmon with Vietnamese caramel sauce Heat ½ tbsp groundnut oil and sauté 2.5cm (1in) fresh root ginger, peeled and finely chopped, and 2 garlic cloves, chopped, until soft. Add 3 tbsp light soy sauce and 100g (3 ½oz) light brown sugar. Stir to melt and cook over a high heat until you smell caramel. Immediately add 1 ½ tbsp fish sauce and 2 tbsp water. It will splutter, so take care. Add 2 tsp tamarind paste and the juice of ½ lime and stir. Taste; it should be syrupy and intense. You may want another splash of water. Season 4 salmon fillets and heat 2 tbsp groundnut oil until hot. Put the salmon in skin side down, and cook for 3 minutes until crispy. Turn and cook for 2–3 minutes, until golden. Check for doneness on the flesh side with a fine, sharp knife. Serve with the warm sauce, boiled rice and stir-fried greens.